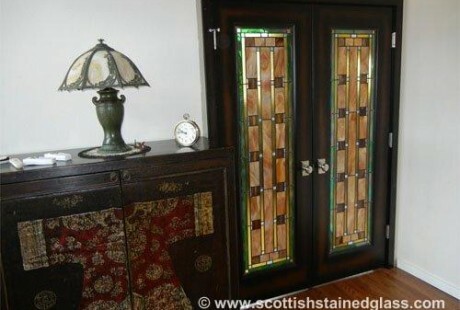 Installation is included in the price of any stained glass window or door that you purchase from Scottish Stained Glass. Different areas of your home and different types of windows may require different installation methods. However, our installations are always up to code for your area. It is always our preference to maintain your existing windows, keeping their thermal properties intact. The stained glass panel we create for you is always set on the inside of the existing glass. In this way, the original glass provides a layer of protection and stability for your stained glass art, preventing any deterioration that exposure to the elements might cause. Another benefit of this installation method is that it provides another level of insulation for your windows or doors, either to keep the warmth in during winter or the “cool” in during those hot Houston summers. This is usually a quick and easy process. Although it might take one of our artisans days or weeks to create the stained glass panel, on average size window takes only about 30 minutes. Our installers are pros, who have been trained in exactly how to handle the stained glass safely and install it for permanency. Our method involves bonding the finished leaded glass piece to the inside of the pane that is already in your window. Although this makes for a much thicker pane of glass, when viewed from the inside, it will seem as if there is only the stained glass panel. You can still touch the lead lines and feel the different textures of glass that you have chosen. When the stained glass is viewed from the inside, it will appear that the stained glass is the only glass in place. You will even be able to feel the lead lines and texture variations of the different types of glass. If your home is a new construction, there are various building codes which must be adhered to as well. Scottish installers always take this into consideration, making sure to stay up to speed on how the windows must be installed and working to code. Safety glass may be required in certain rooms of the home. There are situations that require the Houston stained glass panel to be sandwiched in between two panes of safety glass, such as in a bathroom. Installation is one of the things your stained glass Houston designer will discuss with you when you design your windows. One of our trained installers may also visit your home before your panel is actually manufactured, in case there is any uncertainty or technical difficulties that need to be addressed. Usually, installations go off without a hitch, allowing you to simply kick back and enjoy the beauty of your new windows or doors. It doesn’t matter if your home is new or old, has standard size windows or odd shaped ones. We have developed the methods and expertise over our twenty plus years in business to install our stained glass in any of them!